Vancouver, British Columbia--(Newsfile Corp. - December 13, 2018) - Dunnedin Ventures Inc. (TSXV: DVI) (the "Company" or "Dunnedin") today announced diamond recovery results from kimberlite pipe KH10-11 and plans to advance its diamond assets at its 100% owned Kahuna Diamond Project in Nunavut, Canada ("Kahuna"). Kimberlite pipe KH10-11 was identified during a geophysical data review in early 2018 and drilled during the summer program using rotary air-blast ("RAB") drilling. A representative 152.8-kilogram composite from hole 18-RAB-032 was selected between 12.2 and 109.7 metres depth and sent to CF Mineral Research Ltd. ("CFM") in Kelowna, British Columbia for analysis. Processing returned one diamond in the 0.212 - 0.300 mm sieve fraction. Results confirm the pipe is diamondiferous but likely low grade and further sample processing is not warranted at this time. Details of the drilling at KH10-11 and a map are in the Company's news release dated July 19, 2018. The indicator mineral population recovered from KH10-11 differs from the abundant high-quality diamond indicator minerals ("DIM") present in the JTA. 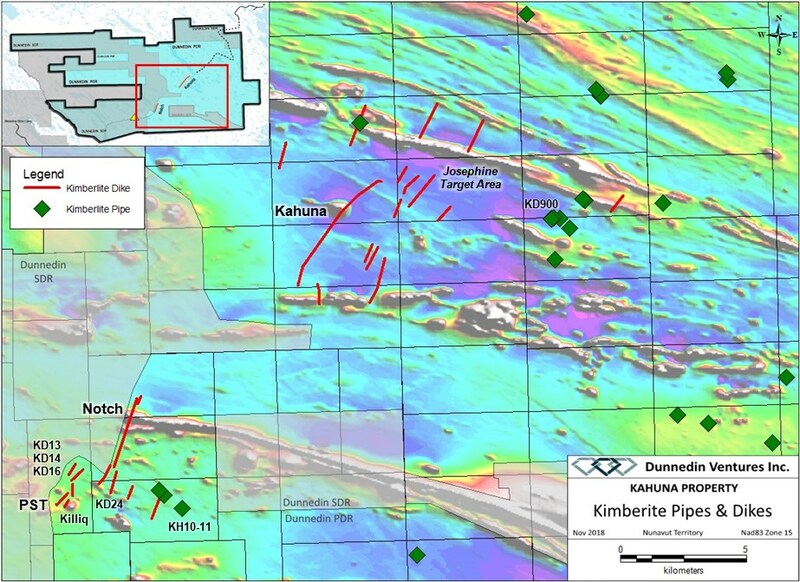 Superior DIM chemistry and dispersion at the JTA continue to highlight this as the most prospective area on the Kahuna property to host significantly diamondiferous pipes with the potential to host large diamonds. Dr. Charles (Chuck) Fipke, Dunnedin's advisor and discoverer of Canada's first diamond mine at Ekati commented, "The abundance and quality of diamond indicator minerals in the Josephine Target Area is exceptional and we have also observed rare indicator mineral chemistry that is associated with large diamonds at producing diamond mines. The source of these indicator minerals is as yet undiscovered and this bodes well for a potential discovery. I will continue assisting the Dunnedin team with the exploration and target identification." The Company is currently processing 109 high priority till samples collected this fall under Dr. Fipke's direction in the JTA. Dunnedin's maiden drill program in 2018 tested only a small number of targets in this high-priority area. Once an up-ice "cut-off" for DIM counts in the JTA is determined, further targets consistent with kimberlite pipes will be drilled. 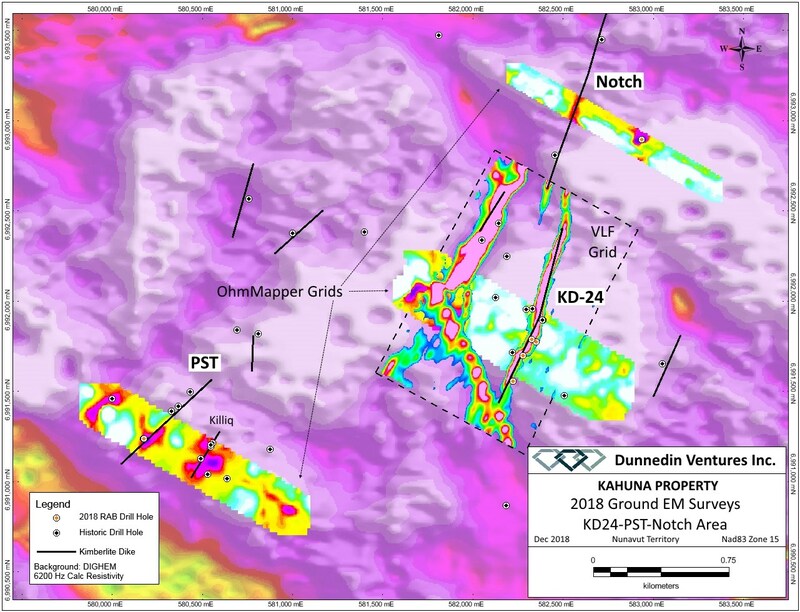 As part of the 2018 exploration at Kahuna, Dunnedin carried out several ground geophysical surveys over known diamond-bearing dikes. Approximately 173-line kilometres in eight grids were surveyed using a combination of Very Low Frequency ("VLF") electromagnetics, OhmMapper capacitive-coupled resistivity and magnetic methods. The VLF and OhmMapper surveys were very successful at imaging and extending the strike extent of the kimberlite dikes targeted (see Figure 1). Drilling at KD-24 in April 2018 extended the strike length of this dike to 225 metres. A subsequent VLF survey at KD-24 suggests a strike length of at least one kilometer, and that KD-24 may represent an offset southern extension of the Notch kimberlite, which is included in Dunnedin's maiden inferred resource. At PST, drilling in 2018 extended the strike of this dike to 350 metres. Similarly, an OhmMapper survey and previous mag surveys at PST infer a geophysical response of at least 500 metres. Both the KD-24 and PST dikes remain open along strike and down dip. Both of these highly diamondiferous kimberlites present upside over and above Dunnedin's inferred resources and are compelling targets for further drilling. Other known diamondiferous dikes include KD-13, KD-14, KD-16, Killiq and Jigsaw (see Figure 2). In total approximately 20 kilometres of kimberlite dikes have been defined at Kahuna through drilling and geophysics to date. These occur within a property-wide network of linear structures that may contain additional kimberlite occurrences but remains largely untested. Casey Hetman, P.Geo., Corporate Consultant at SRK said, "SRK has been providing industry-leading expertise in diamond geology, resource development and mining solutions to companies around the world. Our involvement in kimberlite dike hosted deposits globally and throughout Africa give us unique insight into what it takes to develop these into successful mines. Dunnedin has an opportunity to expand on its maiden resource and their project has all the right initial hallmarks to indicate that further staged evaluation work is warranted. We are looking forward to assisting Dunnedin to unlock the full potential of the diamond-bearing dikes at the Kahuna Project." A replay of the webinar will be posted on Dunnedin's website at https://dunnedinventures.com/media/ the following day. Diamond results reported herein are from RAB holes drilled during the summer of 2018. RAB samples were shipped to the CF Mineral Research Ltd. ("CFM") laboratory in Kelowna, BC for processing and caustic fusion analysis. The material was treated through an autogenous mill-fusion circuit with a lower size cut-off of 0.106 mm. Unlike other microdiamond recovery methods, the circuit can recover nearly all diamonds present in a kimberlite to a predetermined cut-off size, along with associated indicator minerals. Quality assurance protocols include industry standard chain of custody and security procedures during sampling and transport. CFM operates using reference standards, internal quality assurance protocols, security and operating procedures for processing, recovery and reporting of diamond results. The CFM laboratory is accredited and audited for international quality standards through the International Organization for Standardization/International Electrotechnical Commission (ISO/IEC) 17025:2005, which includes ISO 9001:2015 specifications. Dunnedin Ventures Inc. (TSXV: DVI) is focused on its 100% owned, advanced-stage Kahuna Diamond Project in Nunavut which hosts a high-grade, near surface inferred diamond resource and numerous kimberlite pipe targets. The Company holds diamond interests in 1,664 km2 of mineral tenure located 26 kilometres northeast of Rankin Inlet and adjacent to Agnico Eagle's Meliadine gold mine. The Kahuna Diamond Project has an Inferred Resource Estimate of 3,987,000 tonnes at an average grade of 1.01 carats per tonne, totalling over 4 million carats of diamonds (+0.85 mm) (see news release dated March 31, 2015). Dunnedin's drilling is aimed at the discovery of diamondiferous kimberlite pipes, and the Company is working with advisor and largest shareholder Dr. Chuck Fipke to define and prioritize drill targets based on an extensive historic data set, and diamonds and indicator minerals recovered from a series of kimberlite and till samples over four seasons of field work. Dunnedin also holds a 100% interest in the Trapper Porphyry Project in the northern "Golden Triangle" region of British Columbia, and the MPD Project in south-central British Columbia near Princeton. The Trapper and MPD Projects are interpreted to overlie gold-rich copper porphyry systems having surface geochemical, geophysical and regional alteration signatures of considerable size. Based in Vancouver, Dunnedin is backed by a world-renowned team of exploration experts with decades of combined exploration experience and significant capital market strength.